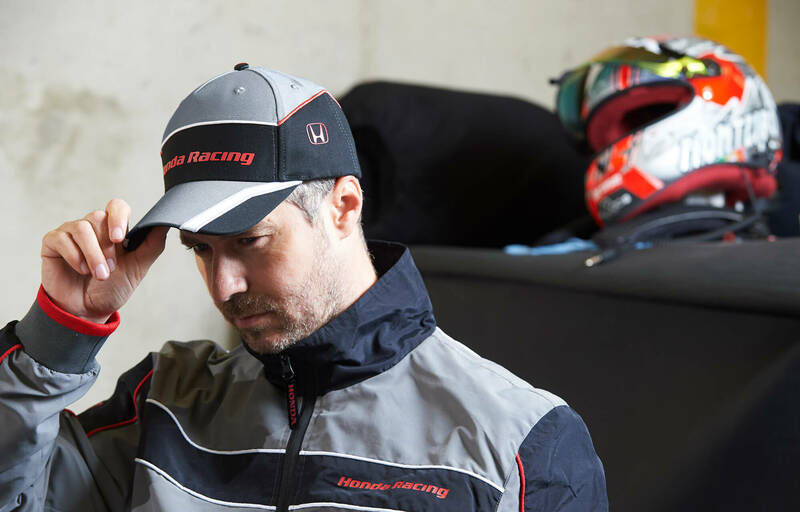 Racing is at the heart of Honda and we proudly embrace our Motorsport heritage with the launch of the new Honda Racing Teamwear collection. 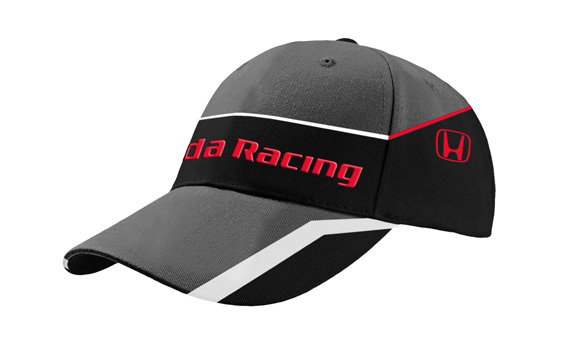 The Honda Racing collection is destined to become the focal point of any racing fan’s wardrobe essentials. Our collection was developed in close cooperation with a renowned brand, whose expertise helped us ensure our Teamwear is produced to the best quality, guaranteed to meet our customers’ high expectations. Thanks to the Honda red piping, contrast fabric and 3D PVC printed logos, these garments perfectly reflect the Honda spirit. Sporty yet classy, this comfortable polo is simply a stylish wardrobe essential, making it ideal for your race weekend. Thanks to the 4-way stretching fabric, you’ll enjoy complete freedom of movement and can be sure it will fit your body perfectly. The difference is always in the details, which is why we’ve added some laser engraved buttons to style it up even more! The combed cotton ensures a soft touch and feel. 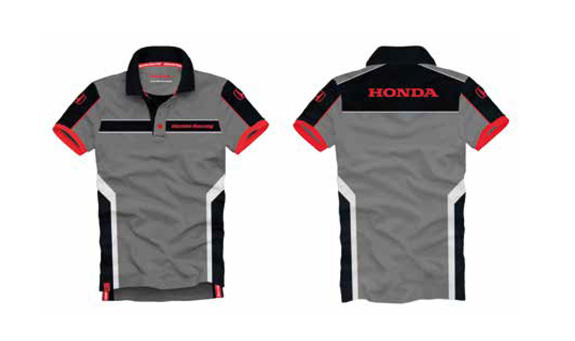 The polo is further enhanced with Honda red and white piping, 3D PVC printed logos and contrast fabric inserts. Team branding can be added on the sleeves. Regular fit, breathable fabric. Material spec: piquet, 95% combed cotton and 5% elastane, 220 gsm. 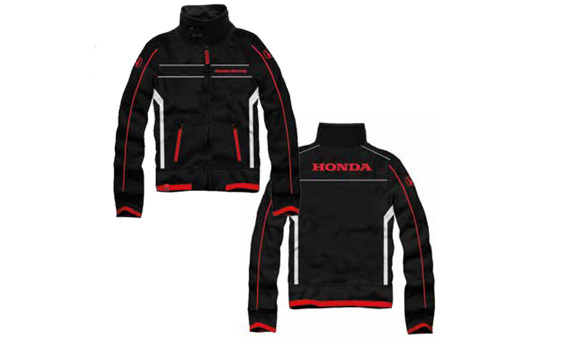 One of the most popular garments from the Honda Racing collection, and simply a basic must have! 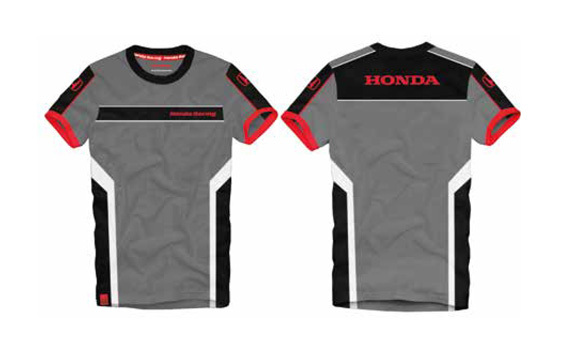 The Honda Racing t-shirt is made in soft 4-way stretch fabric, designed for comfort and practicality. Easily match this t-shirt with any other garment of the Honda Racing collection, or simply wear it with jeans to spice up your everyday outfit. The combed cotton ensures a soft touch and feel. This t-shirt features Honda red and white piping, 3D PVC printed logos and contrast fabric inserts. Team branding can be added on the sleeves. Regular fit, breathable fabric. Material spec: jersey, 95% combed cotton and 5% elastane jersey, 180 gsm. Material spec: 80% combed cotton and 20% polyester, 280 gsm. Thanks to its versatile and enhanced functionality, the lightweight jacket is the perfect garment to wear or throw in your bag, no matter what the trackside conditions are. Made from high quality fabric, it is totally windproof and breathable. As a plus, the jacket has a high quality DWR Taslan coating, making it water-repellent. The inner mesh lining provides you with maximum comfort and protects the jacket’s technical fabric, turning it into a durable garment you’ll want to wear at any time. 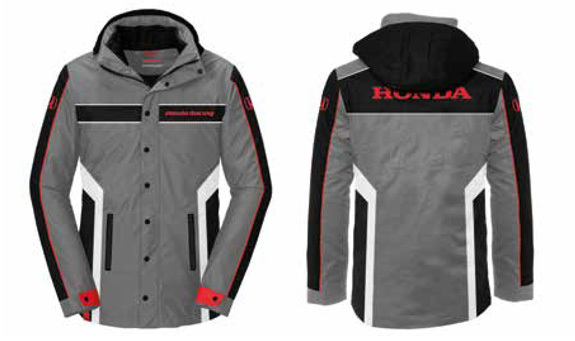 Lightweight but highly protective, this jacket is the ideal choice for any fan who likes to be prepared. 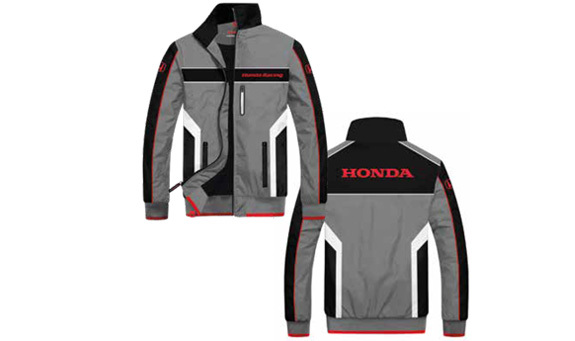 The jacket is styled with Honda red and white piping, printed Honda logos, 3D PVC zipper pullers, an inner pocket and a heat sealed pocket as an additional plus. Team branding can be added on the sleeves. Regular fit. Material spec outside: 100% polyester, 300 gsm, Taslan white coating, material spec lining: 100% polyester mesh, 80 gsm. NOTE: water- repellent ≠ waterproof. Let this beautiful winter jacket keep you warm on cold days. Its soft inner padding will provide you with comfort and warmth, whereas the outside fabric, made out of a technical polyester blend, is designed to be windproof and water-repellent thanks to its DWR Taslan coating. The detachable hood is adjustable at two sides to ensure perfect fit, even in harsh weather conditions. This jacket is destined to become your indespensable winter companion. It is styled with Honda red and white piping, printed Honda logos, 3D PVC zipper pullers, soft-touch press studs, two outside pockets, an inner pocket and adjustable cuffs as an additional plus. Team branding can be added on the sleeves. Regular fit. Complement your Honda Racing look from head to toe with these outstanding trousers, made from a comfortable and breathable blend of cotton and elasthane. Its big side pockets turn these trousers into a very practical garment. 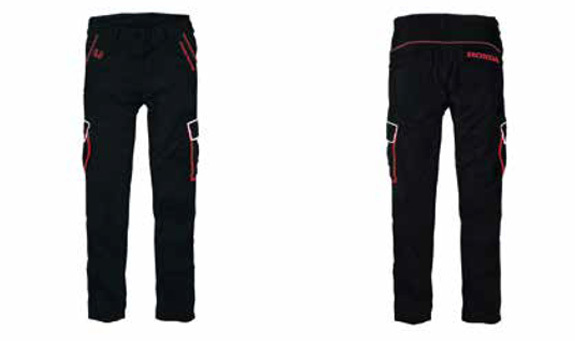 The Honda Racing trousers are customised through Honda red and white piping, 3D PVC printed logos and laser engraved PVC buttons. Team branding can added on the pockets. Straight fit, breathable fabric. Material spec: canvas, 97% cotton and 3% elasthane, 220 gsm. Watch spec: Japanese high quality quartz chronograph Miyota (CITIZEN), black PVD on stainless steel case, genuine black leather strap with red stitching and red lining, carbon fibre dial with red inner ring, date indication, chronograph, tachymeter, 10ATM waterproof (100 meters), hardened mineral crystal, case diameter: 043.5mm. 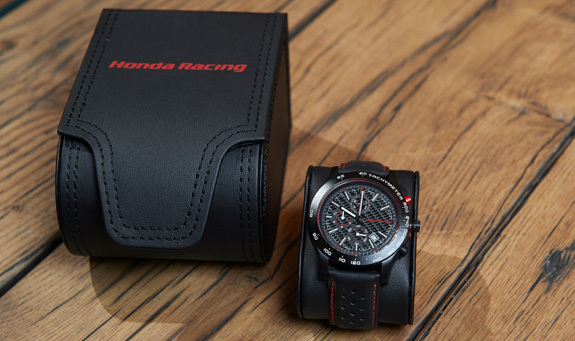 Honda Racing logo on watch face, case back and buckle. H-mark on crown. We took extra care of the details, which is why we’ve added laser engraved buttons, soft-touch press studs and 3D PVC zipper pullers on particular products. And as some extra icing on the cake, we’ve left enough space on our Teamwear garments for your own personal logos and customisation. Whether you like to personalise your clothing to the fullest or you like to keep what you wear simple, our collection will make heads turn. As a matter of fact, you might even bump into some race team members wearing the same setup as you. And last but not least, we’ve developed a high quality, classy sports watch to complement the collection.